As you're cruising down romance lane, with the steady clip-clop of horse hooves and the sweet things your sweetheart is whispering in your ear, you're likely see the back of the head of Kathy Vincent. 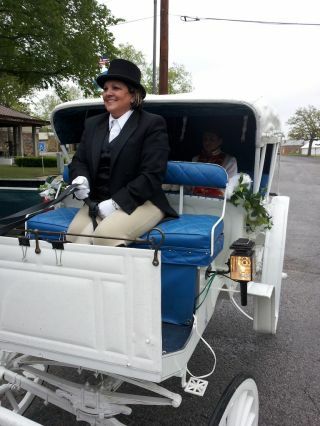 She's the driver and more importantly, the owner and founder of Ava K's Carriage Service. Every magical moment memory you get from one of Ava K's Carriage rides comes from the heart of this woman. We took a few minutes to ask her some questions about how she got the job and what's next. So Kathy, not a lot of people know that the driver of the carriage is actually the founder of this whole operation! When did you first get the inspiration to start a carriage service? I always dreamed of having a carriage as a little girl. When I married Paul, our own wedding had a horse and carriage and my husband drove us down the skinny streets of our quaint little town after the ceremony and that clenched it for me; I began the dream to someday have our own horse drawn carriage and be able to provide that sort of dreamy, fairytale experience that every girl wants. What is the takeaway you want to make sure that every customer of Ava K's has when they use your carriage? I want them to step off that carriage after a 20 or 45-minute ride and take that wonderful romantic feeling with them the rest of the day. I'd like for them to think that it was not only one of the most romantic, but relaxing experiences they've ever had. What has changed about the carriage service industry - and about Ava K's - since you started it? Obviously carriages used to be around a lot more than they are today. It's a real treat to take a carriage ride these days, whether it's during the holidays or a birthday party. The biggest change we've seen is what we've been able to offer our guests as we become more successful. Last year we had a removable "pumpkin top" installed, with strands of lights running down it. You should see what that looks like during our downtown Sapulpa winter rides! It's breathtaking. This year, we'll be adding a real, honest-to-goodness sleigh to our lineup! I cannot wait to have someone take a ride in an actual one-horse open sleigh! That sounds so exciting! What else separates Ava K's from the other carriage services in the area? 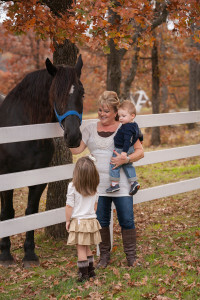 Owner Kathy, with her grandchildren. We do what we do because we love providing the experience for others. Every little girl that gets a Princess Ride to their birthday party, or every newlywed bride that enters their Wedding in a carriage, that's something they'll treasure forever. We also take a lot of pride in the way we handle things with excellence. From the very beginning, I've said that we wanted to be classy, elegant and provide the best experience possible. That's something we've always done well. We've heard that the ranch on which you offer your 45-minute ride is beautiful. Tell us about what we can expect to see there. I really can't do it justice here - you'll have to come see it for yourself! On the whole, it's a relaxing and peaceful countryside. On the return route you have a beautiful view of downtown Tulsa and at night you can see the City Towers. It's so pretty, like we save the best for last. So what do you hope to do with Ava K's in the next year or two? We're looking to get more involved in corporate events. With the addition of the sleigh, we can give real sleigh rides with or without snow! But first and foremost, we want to continue to provide the best elite carriage services available, and to continue doing what we've always done: make people's dreams come true. One last question: Why did you name your company "Ava K's?" That's one of the best parts! Coming up with a company name can be tough. You don't want to seem to egotistical by naming it after yourself, but I also wanted to keep it quirky, fun and easy to remember. I named the business after my first grand-daughter who is named partially after me. Her name is Ava Katherine, and that's where we got the name! It's a little different, but you don't forget it, that's for sure. A big "Thank You" to my loving husband Paul, without you none of this would be possible. The love, care and dedication you put into it makes us shine. Thank you my behind-the-scenes man.